I know, it’s a silly thing to post a blog update about. “Hey guys, lookie see! I made two stretchers”. But, you know what? With all four stretchers made and fit, the end is in sight.. 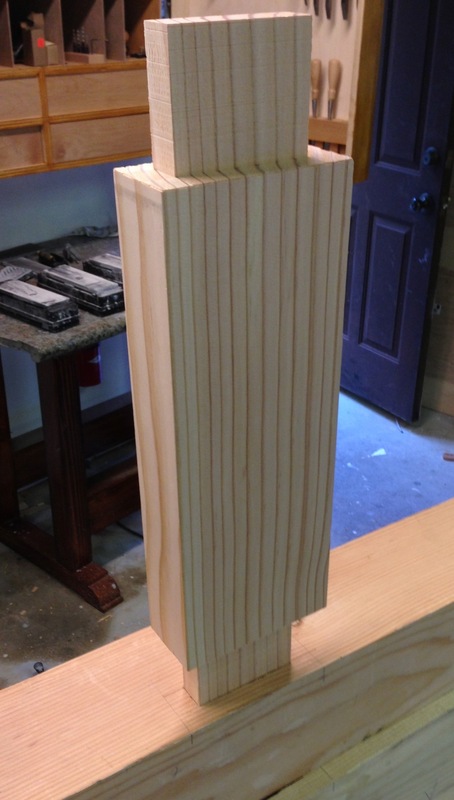 I need to pick up some wood in the morning to make the leg vise and the chop for the end vise. 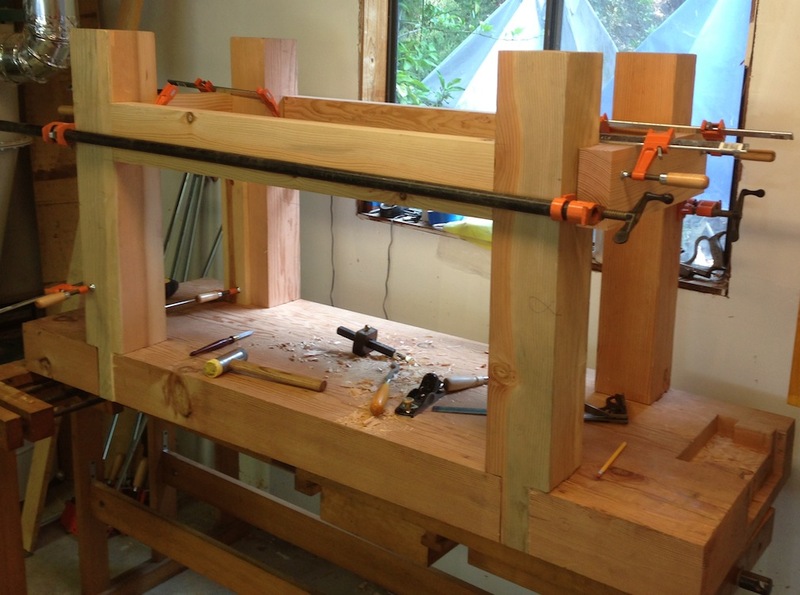 Once I have the leg vise done I’ll be able to glue up the bench, and I can imagine getting to that point this weekend. Maybe. The leg vise has me a little worried, specifically whatever mechanism I use to make the vise close parallel to the edge of the bench. The two popular options are the parallel guide and the criss-cross guide. The parallel guide is what I’ve seen most often, and it’s pretty simple. It just requires a through-mortise in the leg for it to slide through, and a nice snug mortise in the vise chop. But I’m concerned about getting the fit right, especially going through a 5.5″ thick leg. The criss-cross seems like it would be easier to fit, and I can probably make it out of metal I have on hand already. For the $100 that benchcrated charges you’re better off buying one in my opinion, but I want to get this to the next step this weekend and I already have a ton of metal stock. I’ll have to poke through my stock, now that I’ve said that I bet I’ll find I don’t have the right stuff after all. So today I started by milling up the replacement piece of fir I bought to the right dimensions. It’s 3×6 nominal, but the finished dimension is about 2.5x 5.5. I assembled the legs with the long stretchers, made sure they were square to the bench surface, and clamped the short stretchers in place. 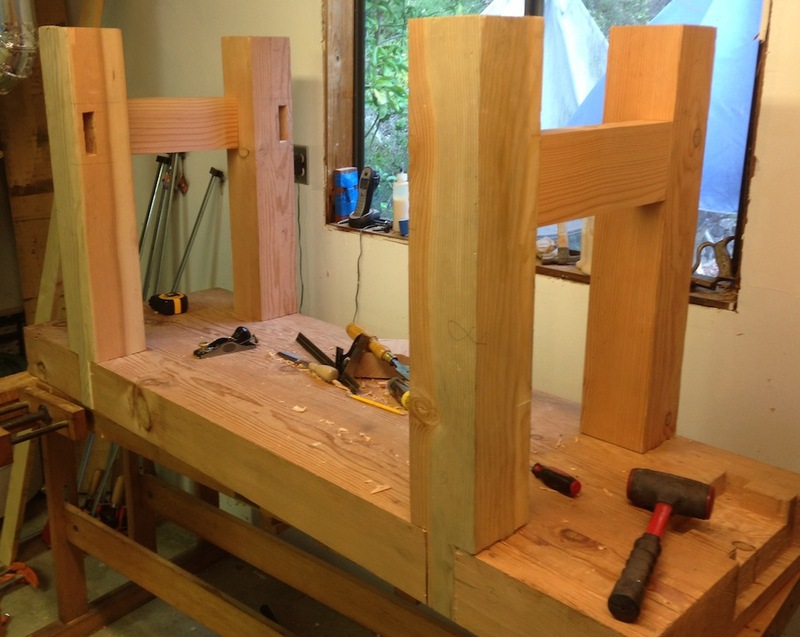 I scribed the inside shoulders, laid out the mortises and tenons, and went to work. I drilled out the waste in the mortises and cleaned them up with a chisel. My mortises are a lot more accurate now. 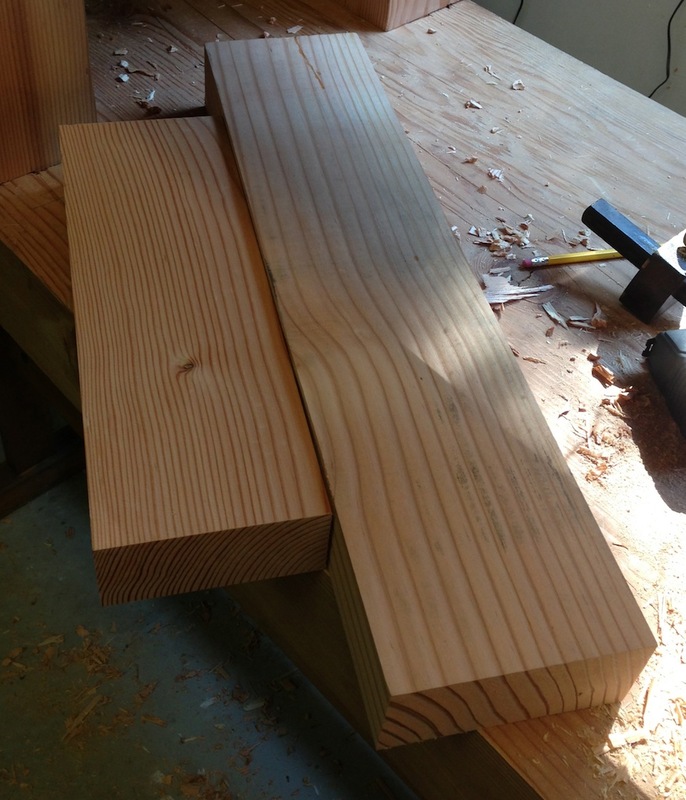 I had to do a little paring on the tenons to get them to slide home – but not much. They all seated nicely, I’m pretty happy with this. The fit with the short stretchers looks pretty good to me. I’m going to clean up all the the leg surfaces with my #8 plane before the final assembly. Just a thin chafing to take of the year of shop dirt and dings they have accumulated. I’m starting to get excited! I’m fitting one this weekend. Wow, that’s a clever idea. Pretty simple. Do you understand the theory? Does it require that slight 1 degree misalignment to make it hold? From what I’ve read on the Englishwoodworker blog a 1-4 degree angle should be enough. I’m going with a 2 degree angle. It’s not a new concept as there are benches with circular holes in them. The linear bearing here I think is key as it only allows movement in one direction. I’ll keep you posted.